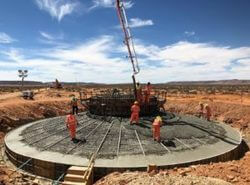 Two wind farms in South Africa have announced to reduce the carbon footprint of their wind turbines by changing the concrete mix of their foundations. 110 MW Perdekraal East Wind Farm poured the first of its foundations on 22 November 2018, while 140 MW Kangnas Wind Farm completed the same achievment the following day. This was followed by a 28-day strength test to ensure that the foundations achieved the required design strengths. Developer Mainstream Renewable Power said that these foundations are designed using a 70% replacement of cement which signals a significant improvement in the concrete mix design for these turbine foundations and a massive CO2 saving. “We have achieved a significant improvement in the concrete mix design for these turbine foundations, with the carbon footprint of the concrete mix design being reduced by 32.5% in CO2 from our round 3 projects. For a project the size of Perdekraal East Wind Farm, it means a saving of approximately 1900 tonnes of CO2, in relation to the previous concrete mix design,” explained Christo Loots, Construction Programme Manager for the Perdekraal East and Kangnas Wind Farms.